The Cinema Audio Society Award for Outstanding Sound Mixing Motion Picture - Live Action was presented to the sound mixing team of Chris Duesterdiek, Jon Taylor, CAS, Frank Montaño. Randy Thom, CAS, Conrad Hensel, Michael Miller, CAS and Geordy Sincavage for “The Revenant”. Top honors for Motion Picture - Animation went to “Inside Out” and the sound mixing team of Doc Kane, Tom Johnson, Michael Semanick, Joel Iwataki and Mary Jo Lang, CAS. Held in the famed Crystal Ballroom of the Los Angeles Millennium Biltmore Hotel and hosted by comedian Elayne Boosler, the 52nd CAS Awards also celebrated the professional contributions of ADR Mixer Doc Kane by honoring him with the CAS Career Achievement Award. 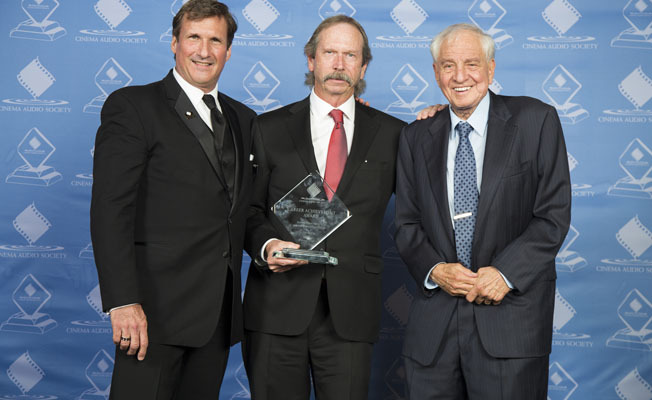 Kane was feted by Garry Marshall and David Fluhr, CAS. Video tributes for Kane, who has over 350 film credits, included special video tributes from both Disney Animation and Pixar, as well as actor Brad Garrett (Finding Nemo, Ratatouille, Everybody Loves Raymond). 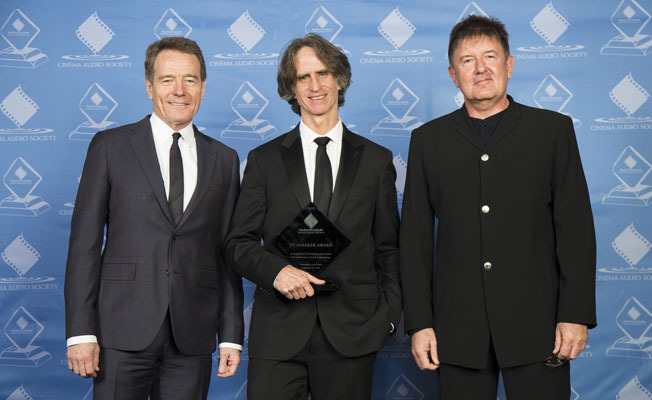 Among other highlights, Emmy Award winning Director/Producer/Screenwriter Jay Roach (Trumbo, Austin Powers, Game Change, Recount), received the CAS Filmmaker Award in a presentation that included remarks by Oscar® nominee Bryan Cranston (Trumbo, Breaking Bad), and John Ross, CAS . Roach joins an impressive list of previous CAS Filmmakers Honorees including: Quentin Tarantino, Gil Cates, Bill Condon, Paul Mazursky, Henry Selick, Taylor Hackford, Rob Marshall, Jonathan Demme, Edward Zwick and Richard Linklater. The Sound Mixing team of “Fargo: Season 2, Episode 5” took top honors for Television Movie or Mini-Series. Television-One Hour honors went to “Game of Thrones: Hardhome”, while “Modern Family: Connection Lost” won the award for Television Series-Half Hour. “Live from Lincoln Center: Danny Elfman’s Music from the Films of Tim Burton” won for Television Non-Fiction, Variety or Music Series or Specials. Matt Yocum a student at Savannah College of Art and Design was awarded the CAS Student Recognition Award and presented with a check for $2500. The CAS Technical Achievement Awards were presented to Sound Devices SL-6 and iZotope RX5-Advanced for Post-Production. Title Sponsor and After Party Host – Dolby Laboratories, Inc.; Platinum Level - NBC Universal Operations, Netflix, Sony Pictures Entertainment; Gold Level – Blue Sky, New Regency Pictures, Universal Pictures, Walt Disney Studios Motion Pictures; and Silver Level – Formosa Group, Fox Studios Production Services, Warner Bros. Studio Facilities and WME Entertainment. Multi-hyphenate Steven Spielberg will receive the Cinema Audio Society Filmmaker Award at the 55th Annual CAS Awards on February 16th, at the Intercontinental Los Angeles Downtown.